Have you ever taken your friends and family on a road trip down south? If not, consider your spring break plans made! At Frog City RV Park in Duson, LA, we offer the very best RV camping experience, complete with a casino, café, outdoor saltwater swimming pool and much more, all in walking distance from your RV. 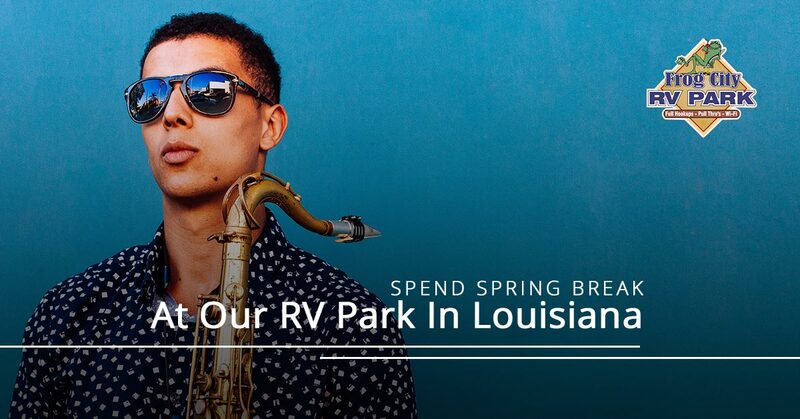 From our RV park attractions to local events, here is a list of must-sees for your spring break 2018 in Duson. At Frog City RV Park, we are known for our luxury saltwater pool, which is perfect for cooling off on those hot spring and summer afternoons. Whether you are going for a quick dip, starting a pool game with the kids or just want to sunbathe all day and get a nice bronze tan, our pool is always open for you to use. Just don’t forget your sunscreen! We are fortunate to be located just a few minutes walk from Lucky Deuces Casino, which is respected as Duson’s friendliest, safest and most fun place to gamble. The casino is always revamped with the latest games while also holding on to the classics like wheel spins, Plinko drawings and a variety of poker games. After a long day of cooking by the fire, playing camping games and going for a swim in our saltwater pool, a night of fun always awaits you at Lucky Deuces. Plus, alcohol is served 24/7! If you love live music and giving to a good cause, Hopefest Music Charity Festival is for you! This annual family-friendly event brings big name music stars to Lafayette as part of the day-long outdoor festival to raise money for local charities that help those in need. This year’s performances include The Getaway, Natalie and Julia Spielman, Surprise Young Talent, Combo, Beau Young Band and many more, including headlining performances by Roddie Romero & the Hub City All-Stars and MacKenzie Bourg. Be sure to bring your hunger for true southern comfort food — vendors will be serving up classic Louisiana fare, including boiled crawfish, jambalaya and southern barbecue. When it comes to partying, Lafayette does it right. Every spring, there are a variety of pub crawls and downtown events to take part in, including this bucket list-worthy event. On Saturday, March 24, DJ RV and Social Entertainment will lead pub crawlers to each participating locations, including Dat Dog, Reve Coffee Roasters, The Greenroom, Marleys, The Wurst Biergarten, and The Jefferson Street Pub. The best part? All cocktails, food, music and entertainment will be 90s-themed, so don’t forget to dress up in your wackiest 90s attire. This one’s also for the adults! Coming to Lafayette this Wednesday, March 28, is AFROMAN live in concert at Grant St. Dance Hall. Known for his goofy hit single from the year 2000, “Because I Got High,” the American rapper will grace the stage with his throwback songs, so be prepared to get down to the classics you grew up with. Tickets are on sale now for $10-40, so get them while they last! Whether you’re coming home for spring break or are venturing down south for the first time, Frog City RV Park in Duson, LA is the perfect place to stay! From our luxury attractions and amenities to nearby events and fun places to see, we’ve got it all right here in our backyard. Contact us today to schedule your best spring break trip yet!